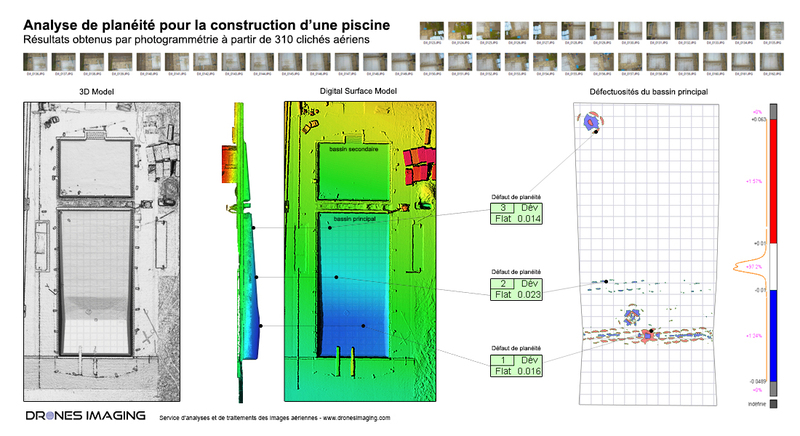 3D modeling and analysis of a swimming pool under construction. Results obtained from 310 aerial shots. 3D modeling carried out as part of a study to control the flatness of a swimming pool under construction (with a minimum tolerance of 1cm). The analysis of the 3D model made it possible to extract a dozen minor deformations (holes and bumps) whose tolerance is between 1 and 2 cm but also to identify two superficial depressions of about 3 cm. Apart from these detected faults, our results showed that 97.2% of the surface inspected is flat. Airborne platform: DJI Mavic pro. Dense cloud : 50 million points.